President Trump marks Memorial Day with a speech at Arlington National Cemetery on Monday. President Trump joined Americans on Memorial Day in paying respect to those who gave their lives for the country, laying a wreath at the Tomb of the Unknown Soldier at Arlington National Cemetery. 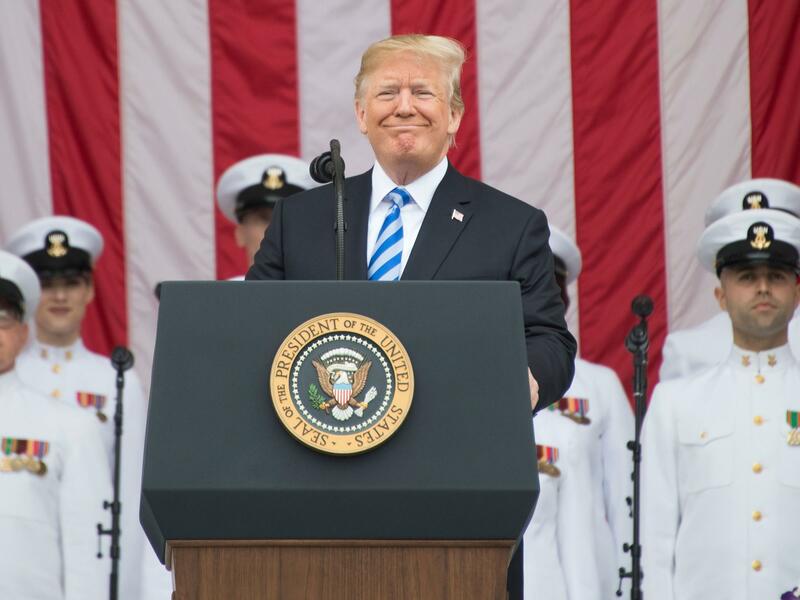 "Our fallen heroes have not only written our history, they have shaped our destiny," Trump said, speaking at the cemetery's Memorial Ampitheater. "They inspired their communities and uplifted their country and provided the best example of courage, virtue and valor the world will ever know. They fought and bled and died so that America would forever remain safe and strong and free." "They came from every generation — from towering cities and windswept prairies, from privilege and from poverty," he said. "They were generals and privates, captains and corporals of every race, color and of every creed. But they were all brothers and sisters in arms. And they were all united then, as they are united now, forever, by their undying love of our great country." Hours earlier, the president had used the day's themes to praise the current state of the nation in a comment on Twitter that drew criticism from some. "Happy Memorial Day! Those who died for our great country would be very happy and proud at how well our country is doing today. Best economy in decades, lowest unemployment numbers for Blacks and Hispanics EVER (& women in 18years), rebuilding our Military and so much more. Nice!" he tweeted. The tweet struck some as self-serving. "This is one of the most inappropriate, ignorant and tone-deaf things our Commander-in-Chief could have said on a day like today," tweeted John Kirby, a State Department spokesman during the Obama administration. Retired Army Gen. Martin Dempsey, former Chairman of the Joint Chiefs of Staff under Obama, seemed to chastise Trump in a tweet of his own. "This day, of all days of the year, should not be about any one of us," he wrote. "No matter how prestigious or powerful, no matter how successful we perceive ourselves to be. Rather, this day should be about those who gave their lives so that we could live ours in freedom." Meanwhile, the president's family members focused on remembrance. "On #MemorialDay we honor the many Americans who laid down their lives for our great country," Melania Trump tweeted. "As one nation under God, we come together to remember that freedom isn't free. Thank you to all the service members & their families who sacrifice so much to keep us safe." "As we remember our fallen servicemen and women, our hearts are filled with gratitude for their sacrifice and awe of their courage," Ivanka Trump tweeted.